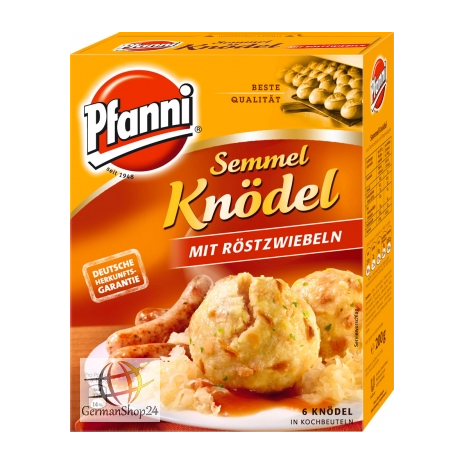 Do you like classic style bread dumplings? Then this variety might just be a perfect addition to your shopping list. Added roasted onions give these bread dumplings extra flavor. The ideal companion for classic roasts or a creamed mushroom casserole. Bring to a rolling boil and immediately reduce heat to a simmer for 10 minutes. 65% bread crumbs (wheat flour, salt, vegetable fat, paprika), 8% roasted onions (onions, vegetable fat), vegetable fat, starch, wheat flour, powdered egg, durum wheat semolina, salt, chives, spices (with celery seeds), yeast extract, flavoring, sugar. 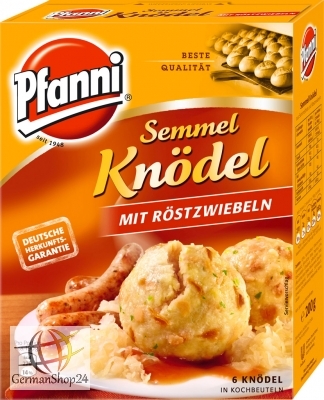 65% Semmelbrot (Weizenmehl, Speisesalz, pflanzliches Fett, Paprika), 8% Röstzwiebeln (Zwiebeln, pflanzliches Fett), pflanzliches Fett, Stärke, Weizenmehl, Eipulver, Hartweizengrieß, Speisesalz, Schnittlauch, Gewürze (mit Selleriesaat), Hefeextrakt, Aroma, Zucker.